William was born in Gloucester on 9 May 1891, the son of Robert, a shipwright, and Ellen Washbourne. The family variously lived in Barton Street, Moor Street and Ladybellgate Street. William was employed as an engineering fitter at the Gloucester Railway Carriage and Wagon Company Ltd, having first gained experience as an apprentice at Messrs Fielding and Platt Ltd (Engineering Works). In 1909 William, a wing, joined the Gloucester Club and until the end of the 1923 season, allowing for a non-playing break between 1914 and 1918, made 203 appearances for the Club, of which 169 were for the First XV. During this period he scored seventy-eight tries for the First XV and twenty-eight for Gloucester A, amassing a total of 238 and 84 points respectively. 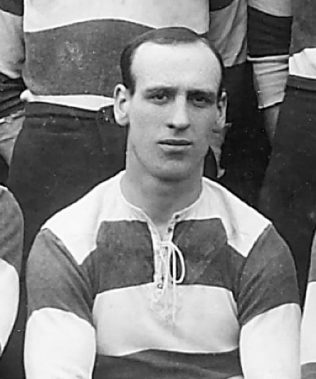 The Citizen described him as “…a dangerous man in attack and a clever and resourceful defender [who got through] “…a lot of useful work and scored some clever tries” His prowess was recognised by the County selectors and between 1910 and 1914 he was awarded sixteen County caps and scored seven tries; his County career also included a game in 1912 against the touring South Africans. William was a member of a Gloucester team which after a three day journey, played Toulouse at the Stade Toulousain in February 1911, winning by 18 points to 13 points. Although this was William’s first visit to France, it would not be his last. In 1910 he joined the 5th Battalion, Gloucestershire Regiment and served as a part-time Territorial soldier for four years. On 31 August 1914 he re-enlisted in his battalion and his presence, along with that of Lionel Hamblin, Sid Smart and Albert Cook at a recruitment drive at Shire Hall, encouraged the other men and that night between 300 and 400 of them similarly stepped up to do their duty. During the training period William continued to play rugby, notably playing for the Battalion XV which defeated a Canadian XV at the Queen’s Club in December 1914 and as part of D Company which won the Inter-battalion cup in 1915. On 29 March 1915 his battalion landed at Boulogne en route to the Western Front. In a spell out of the trenches William was a member of the 48th (South Midland) Division XV which defeated a 4th Division side containing English, Irish and Scottish Internationals in April 1915. He rose to the rank of Corporal and survived the attack at Pozières which had resulted in many casualties amongst the Gloucester players. A few weeks later he was awarded the Military Medal for bravery although sadly no citation exists. After being wounded in November 1916, William returned home on 22 January 1917 and in June was discharged from the Army in order that his engineering skills could be utilised at Messrs W. Beardmore and Co. Ltd, Parkhead Works, a munitions factory in Glasgow. In 1917 he also married Ellen Charles and together they had one son. In the same year he was given the option of either a formal presentation of his Military Medal or with no fuss it could simply be posted to him – William chose the latter. After the war William returned to Gloucester and continued with his rugby career. He died on 5 January 1977 at Wickwar, Bristol, aged 85 years. His funeral was held at the Gloucester Crematorium. William and his family emigrated to USA, arriving 1 Dec 1922. They lived in Rochester, Monroe County, New York State, until returning to Gloucester on 7 July 1932.